Dress c/o / Heels c/o Banana Republic / J.Crew Clutch / Earrings / Lips in "Cruella"
Today I'm sharing my third and final (for now!) look with Verity (see the last two here and here) and I guess you could say I saved the best for last. You know when you put on a piece of clothing and for some reason you just feel so good? That's this dress for me. When I was younger I definitely didn't always dress for my body type and as I've grown up, I've learned what does and doesn't work for me. I love the v-neck, fit and flare waist, and the accordion pleats, all factors that flatter my body type. Beyond that I'm loving the royal blue color and small floral print. 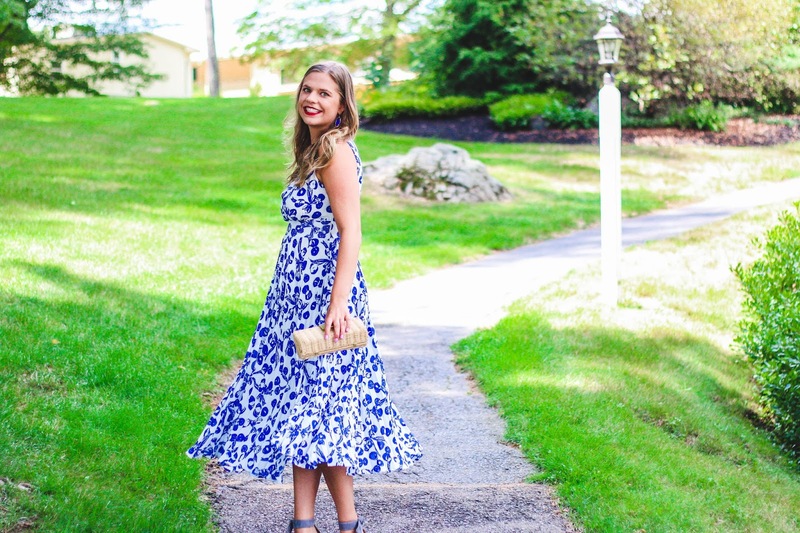 It's the perfect dress to wear to an end of summer or early fall wedding! P.S. Today is the last day to enter to win $50 to Verity! All you have to do is go to this Instagram picture to enter!